i just see a blank page. why? If you open your browser's console(Ctrl+Shift+J in Chrome), do you see any error messages? Do you see any relevant messages in your web server's error_log? Did you download the plugin from h5p.org or GitHub? I assume that some files are missing. Also (and I don't know if this is the place to ask) I can't upload a picture to use de Find the Hotspot activity. Keep an eye on your web server's error_log while doing this. There may be some useful information if something goes wrong. @error_reporting(E_ALL | E_STRICT);   // NOT FOR PRODUCTION SERVERS! @ini_set('display_errors', '1');         // NOT FOR PRODUCTION SERVERS! $CFG->debugdisplay = 1;              // NOT FOR PRODUCTION SERVERS! Remember to remove them once you're done. Hi, when I click on H5P libraries (site administration/plugins/activities modules/H5p... etc.) it shows a 404 page. 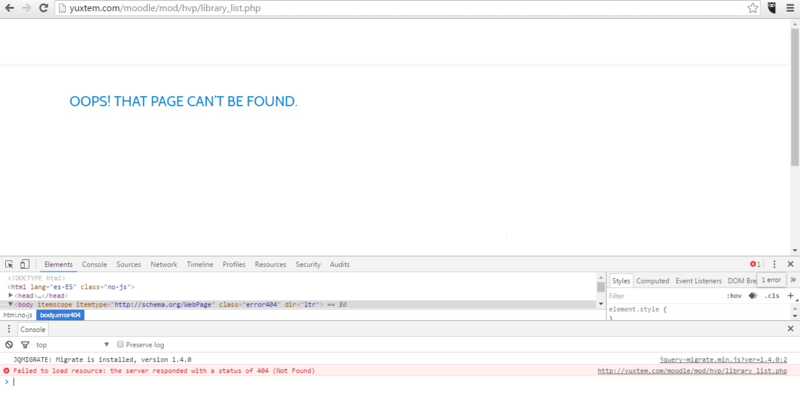 I send you a screen shot of the error that shows on the element inspector of Chrome. I hope you can help me to solve this problem. I really like to use your activities and it's such a shame not been able to use it as a pluging on moodle yet. Jikes, which version of the Moodle plugin are you using? Is it the on on h5p.org/moodle, or have you downloaded from github? First I've downloaded from h5p.org, when it didn't work I've uninstalled and downloaded the github version and now I can't even install the plugin, it says some moodle assign files are missing. The version was 0.2.0 on H5P, and 0.2.0 of February the 1st on github. There will be a new Moodle version ready very soon. You can try out from github now. We're regression testing it but the devs says it should work, or you could wait until next week when we release a new version. I am not able to see any editor or even when i uploaded the h5p files created from h5p site, its not showing anything. 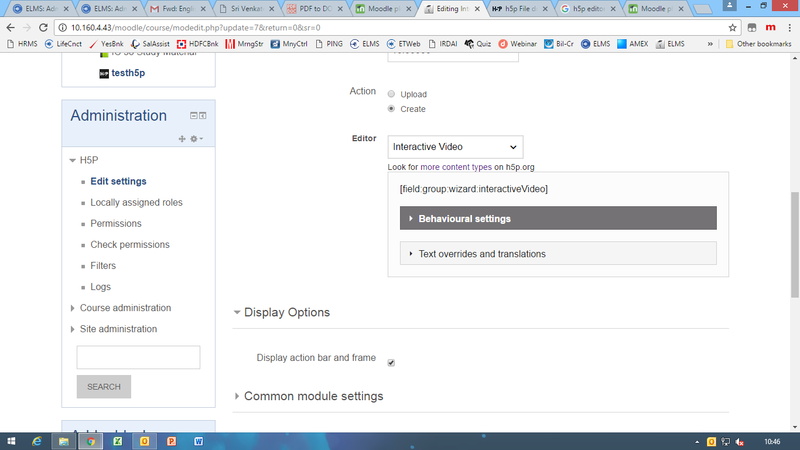 Im using moodle 3.2 version. dont know if its any version compatibility. Kindly guide. H5P is not yet officially supported in Moodle 3.2. Some fixes for Moodle 3.2 can be found in this thread: https://h5p.org/node/38304, and should be officially released within this month. Do you get any errors in your console when the H5P fails to show ? Hi, Im writing in continuation to the previous mail. I have upgraded the hvp plugin to the 3.2 version as my moodle is running at 3.2. im attaching the screen shot for your reference. Kindly let me know if anything can be done to rectify the same. Hi, it appears like you are missing one or more H5P libraries. Installing the latest official libraries package from https://h5p.org/update-all-content-types should resolve this for you. Hi, I have tried installing the updated library as suggested. Still the problem persists. Kindly suggest if anything else can be done to reolve the same. Hi, Just wasnted to update that even when i upload a h5p video created from the h5p.org, its showing blank screen. Can you have a look in your browser console (F12) and see what errors you are getting there ? Also check your server php error log, and show us what you find. What version of the H5P plugin are do you have on your server ? I am not able to find any errors in the Browser console. The version of H5P that i downloaded is for Moodle 3.2. The file name is - official-h5p-release-20170120. I am not sure how to check the php error log. The php error log is located on your web server, decided by your configuration, but usually it can be found at one of the locations indicated in this post. Also make sure that your webserver has read and write permissions to your moodle data folder, and see if you can find an answer to your problem from this thread that have had similar problems. Hello. Once I discovered that H5P content can be enbedded throughout a Moodle site, it occurred to me that this might be a way to get H5P content to fuction in the Moodle Mobile app. I created some H5P content and added it to a Moodle Lesson. The content displays well through the browser, but when viewing in the Moodle Mobile app users see the following message "You do not have access to this content. Try logging in." I know that creating an add-on for the Moodle Mobile app is extremely challenging, but if it were possible to include H5P content in the app via iframes, this would be an incredibly useful work-around. That is a very good idea. Were you logged in via the mobile app with a user that had access to the H5P content if logged in via normal web?